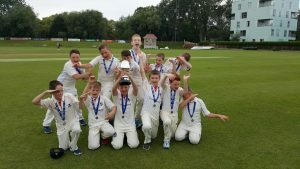 The gated community of Merrion was the venue for the Under 11 Cup Final on Friday and the hosts took first go at getting a score. Some enterprising batting saw them set off like Usain Bolt as their top 3 retired on 25+ runs. 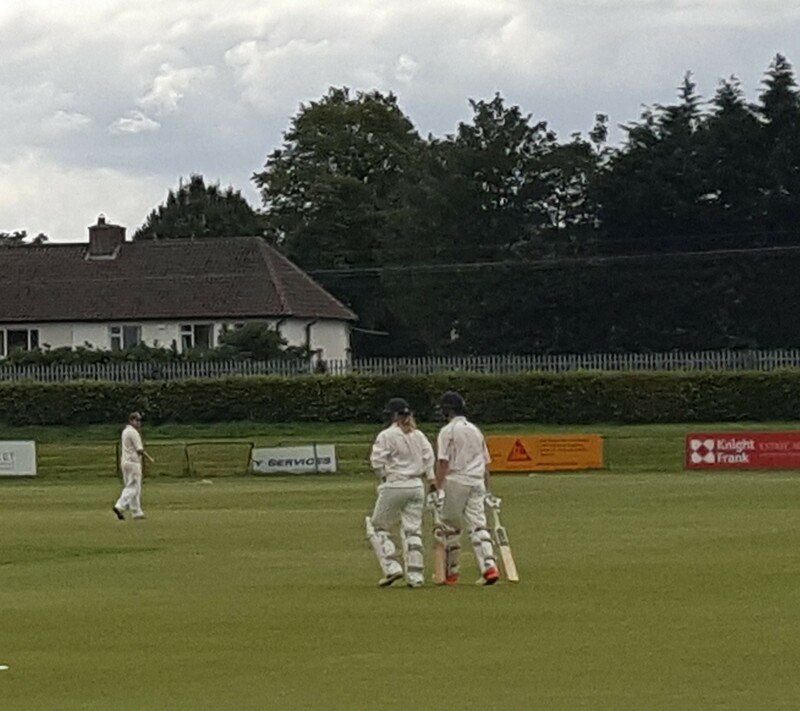 However, some great death bowling by Donncha Tucker, William Beatty and Eoin Sheridan Pope restricted Merrion to only 13 runs from the final 5 overs. Pembroke opened with Donncha and Ethan Clarke, who got us off to a steady start. Donncha was bowled with such a peach of a ball that the man from Del Monte was on the phone to say yes. Macdara came to join Ethan and this pair really got going – Ethan worked the ball to get Mac on strike allowing him to hit out. Mac retired on 28 runs while Ethan kept hitting his singles and the odd boundary – Ethan eventually retired on 27, leaving Eoin on 15 not out, Lexi after some quick scoring was run out in the 18th over allowing Jack O’Riordan to hit the winning runs. A great performance by an unbeaten team. 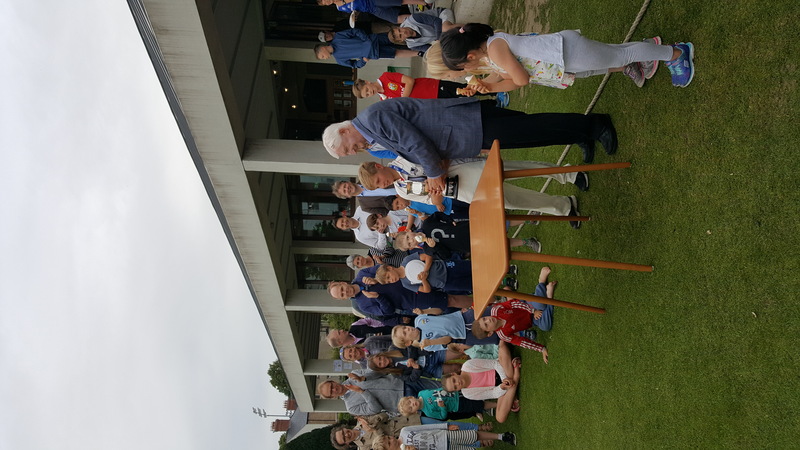 The Cup was brought back to Pembroke in style and paraded before the large group of parents that came down for the very successful Curry night with their U9 kids. Well done to Bhawna for the delicious food and for saving some for those of us at the Cup Final. A successful evening all round and I’m sure there was more than one group of parents put to bed by their kids that night. The following morning some bleary eyed coaches and parents took the Boys Under 11C team to Rush but unfortunately came home winless. The Men’s 3rds took a similar route but carried on up the coast to the home of Wavin (anyone else think they dropped the “g”? No, just me) in Balbriggan. The home side put themselves in and then got themselves out quicker than a hall full of dancers doing the hokey-cokey. Faran and Lenny grabbing 4 wickets each. 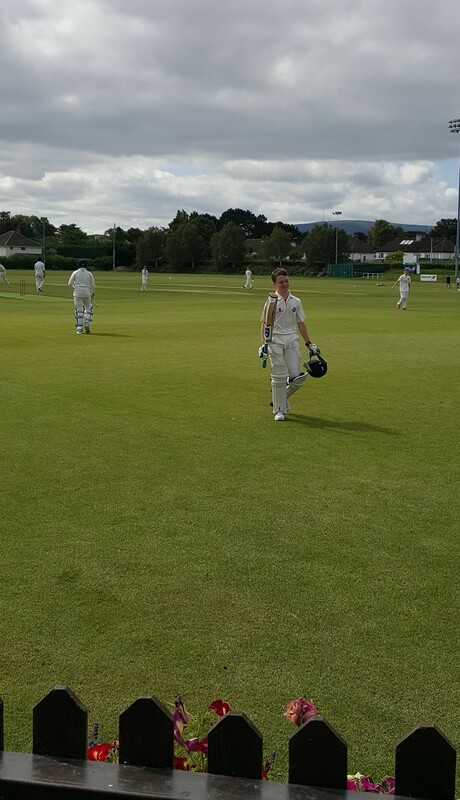 Joe P and Shovey led the scoring as the 3rds won by 7 wickets. Meanwhile, in the ‘Broke history was made as Kim Garth became the first woman to play top level cricket for Pembroke. Unfortunately, what happened when we went out to bat is, like a politicians promise, best forgotten with only Club Coach Conor and Jack getting in the 30s. Paul took a couple of quick wickets to give us a bit of hope only for Sorensen to dash it with some power hitting – hopefully he’s over The Hills and far away this weekend. 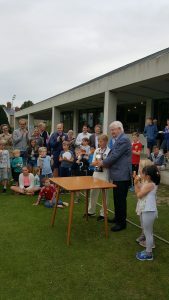 Sunday morning had most of our Under 9s out in Malahide for a blitz from which they returned unbeaten helped by their overseas pro Conor Sharp. 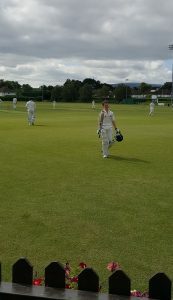 At home the Under 13 Boys team won their first game of the season in some style by about 40 runs, captain Noah (above) top scored and retired on 37. While out in Rush our unbeaten U15 Girls won their cup game with only 9 players! Later that day the Furious Fives took on the financial clout of AIB in the Minor Cup and after a brief high of having them 13 for 3 we plummeted faster than the Dow Jones on Black Tuesday, Wednesday, Thursday and Friday. One of their openers plundered 132 from a total of 271 in 40 overs. Sometimes you wonder what these players are doing setting records in Division 14 when they could be playing so much higher. Perhaps the match fee is that much better in a semi-state bank. Vulker was the pick of our bowlers, broken finger and all, as he took 4 wickets. Our response lasted as long as one of Chunky’s pints with only Graham and Rafi getting into the 20s. A disappointing but not unexpected defeat. On Monday more runs were piled on, this time by our own Ladies 2nds in their cup semi-final in The Hills. 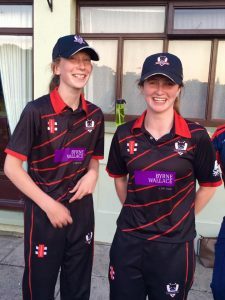 Orla P scored an unbeaten and unselfish 99 while Eimear Mullen got her first senior 50 as the Ladies scored 197 in 20 overs and won by 100 runs. The final is in the gated community of Merrion on 4th August and your support is encouraged (and expected!). The Alan Murray quarter final against Phoenix took place last night in the ‘Brook. A total of 147, while good in a game of snooker looked a bit under par. Some really tight bowling and fielding – Paul 2 for 12 from 4 overs the pick – took us to a 13 run win. However, the real excitement came off the pitch as Ashley (Holmes) and Barry (Watson) spotted a suspicious looking character (apparently he was hanging around on Sunday). 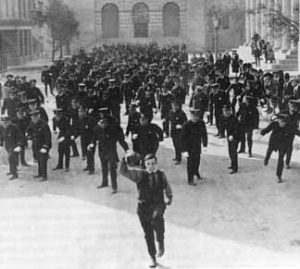 After being confronted by Ashley in the changing rooms the thief took off with the Pembroke batters in hot pursuit, they were soon joined by various spectators, Phoenix fielders, umpires and kids in a scene that wouldn’t be out of place in a Keystone Cops movie. I can’t be the only one who had the music from Benny Hill running through my head. The thief was eventually apprehended in the Balbirnie’s front garden and Phoenix own off duty Guard (thanks Constable Ronan!) showed the correct technique for a choke hold as he was paraded to the waiting cop car in the car park. Copies of the cctv footage are available for a reasonable price behind the bar. One of the big lessons is: don’t leave anything of value in the changing rooms, including car keys. Thursday our unbeaten U15 Girls travel across the Bay to take on Clontarf. Later that evening our Ladies 1sts have their first game in weeks as they take the Dart to Malahide for a 6.30pm start. On Saturday Sharpy leads the Pembroke Oldies in their annual grudge game against the crocks of YMCA. Start time is 6pm or whenever the team gets out of the bar. The Girls U13s are up early on Saturday to trek to The Hills. The Men’s 1sts also have an early start at home in the first Alan Murray semi-final against Merrion at 10.30. The second semi-final is between The Hills and Clontarf at 2pm with the final at 5.30pm. There is a full days entertainment planned on and off the pitch with the games also being live-streamed on the web. Meanwhile the Men’s 3rds are in Merrion in the semi-final of the Middle Cup. Later that evening the Ladies 2nds make their way to Rush for a league game. On Sunday we have both 4ths and 5ths out with the 4ths home to Clontarf and the 5ths trying to find the Greystones wicket in the middle of a golf course. The Men’s 2nds make the trip across the Bay for a Div 3 game in Clontarf. On Monday our Boys U19 are home to Merrion while the Girls U13s are at Leinster. The Boys U13 try to make it two wins in a row at Phoenix on Tuesday. There promises to be a great game out in The Hills later that evening as our Ladies 1sts play a Senior Cup semi-final. Please do your best to get out and support at least one team this weekend, it is greatly appreciated. We are running a bus to Waringstown for the Irish Senior Cup semi-final on 12th August – if you are interested please let me know (087 636 96 36 or daly-smith@hotmail.com). We have room for 53 passengers so its first come first served. I’m hosting our second lunch of the season for the Div 1 home game against Clontarf on 19th August, again let me know if you are interested. Becca is also running the first ever Pembroke Afternoon Tea on 26th August – more details to come. Our very own Hoppo along with former player Stephen Moreton have set up their own consultancy business – Trigger Movement. So if you are interested in disruption (as an old anarchist I’m not sure we share the same definition!) in business you know who to talk to. Formal declaration: I haven’t received any payment or gratuity for this ad (but I do expect a pint). And some of the best news this season – Miriam Grealey received an honourary life membership from the MCC. This is a fantastic recognition of all that Miriam has achieved in Irish cricket, particularly in pushing back the boundaries for Ladies cricket here. Well deserved and I can’t wait to see the blazer!